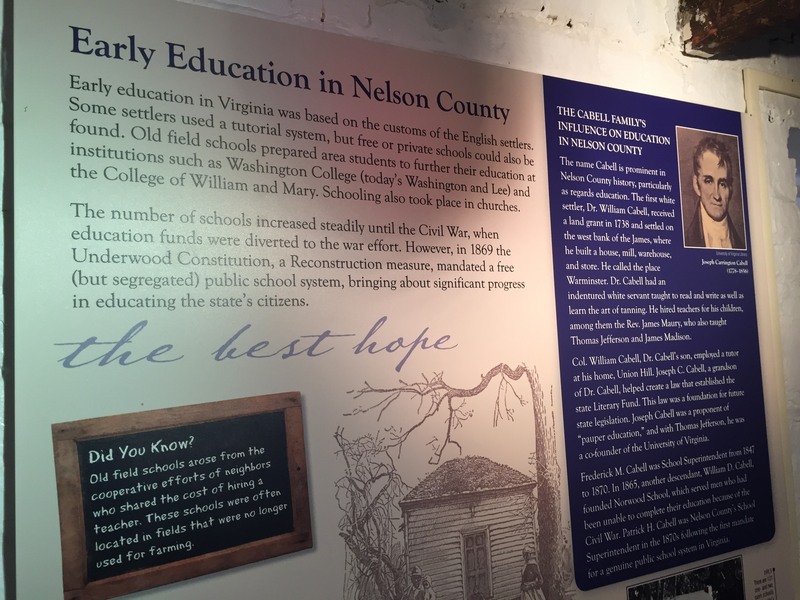 “The Best Hope," an exhibit on the history of the Nelson County Public School system, focuses on the materials used in schools in the 1920s and 1930s. The exhibit's name is taken from speeches and writings of Nelson County native Robert Whitehead, delegate to the Virginia General Assembly from 1941 until his death in 1960. Thanks to the donation of text books, notebooks, photographs, report cards and other school-related materials by the family of Elizabeth Wheeler, who attended school in Schuyler, visitors are able to get a glimpse of school life in Nelson County during the Depression. The exhibit includes panels describing the highlights of the educational system from the colonial times to the late 20th century includin role of the Cabell family, particularly Joseph C. Cabell, in establishing schools in the post-colonial period. Other panels highlight the contributions of Dr. Catherine Seaman, the first female School Board member; Harry Harris, the first African-American School Board member; and School Superintendents W.E. Kidd and Henry Conner. Kidd presided over the schools from 1920 to his death in 1954, a period of consolidation, and Conner presided during a period of rapid change, including the establishment of a vocational wing at the high school and kindergarten programs.